THIS TIME, as they say, it’s personal. I am a recovering victim of “modern amnesia.” Maybe you are too? This issue tells the story of Christian thinkers in the last half of the twentieth century who asked questions about faith and found the answers of the modern world unsatisfactory. When they consulted their own denominations for answers, those groups seemed to have forgotten something as well. These thinkers saw mainline Protestants and some Catholics straying from a commitment to the supernatural origins of Christianity and the inspired truths of the Bible, and they saw evangelicals ignoring devotional practices that had nurtured Christians for centuries. In response these thinkers turned to the early Christian church fathers and mothers and their doctrinal commitments, devotional practices, and ways of worship. In so doing they found their lives transformed. With a gathering intensity, they began to speak, publish, meet, and found organizations devoted to spreading the good news to the rest of us. At seminary I learned of the riches of early church theology and devotion, and found my spiritual life strengthened by fasting, disciplined Scripture study, and frequent Holy Communion. Eventually I became Anglican. Webber describes people somewhat like me in his most famous book, Evangelicals on the Canterbury Trail—the “Canterbury trail” being a metaphor for a spiritual journey into Anglicanism. Of course many who were influenced by these thinkers remained in their original churches and worked to recover the riches of the early church there as well. This issue is an attempt to understand a movement that, over the last few decades, has sought to combine the best aspects of evangelical and sacramental Christianity, grounded in the Bible and guided by the first few Christian centuries. 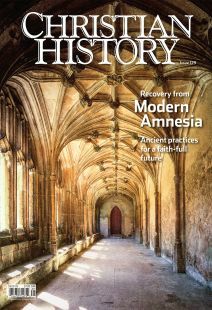 We begin the issue with four writers and thinkers who speak mostly to Protestant evangelicals—Oden, Webber, Willard, and Foster—and then we move outward to trace a turn back to the ancient sources of our faith among Roman Catholic, Orthodox, and mainline Protestant figures. We also deal with the difficult question of whether renewal can sometimes revive things better left behind.